The fierce little track-friendly 2017 Audi TT RS will make its American debut at the New York International Auto Show in a couple of weeks, showing off its sharp cuts, five-cylinder engine, and its hefty $65,785 starting price tag. 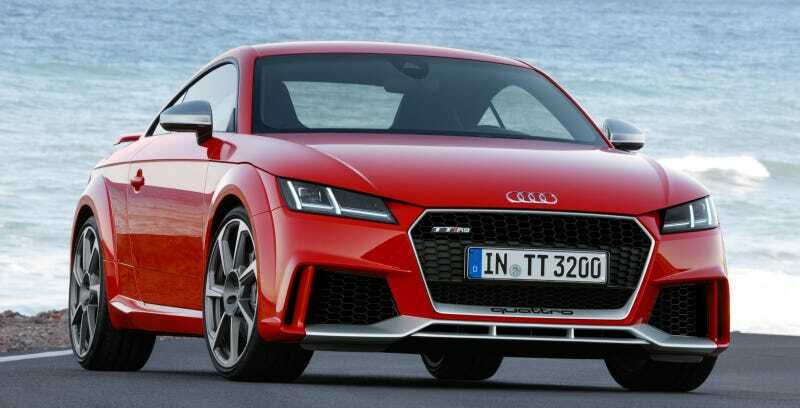 Jalopnik already had racing driver Rob Holland throw the TT RS around a racetrack late last year, saying it was the best thing available from Audi save for the R8 supercar. That’s quite an endorsement. The specs for the TT RS include the 2.5 liter five-cylinder yapping out 400 horsepower and 354 lb-ft of torque, like a little angry dog that knows the way to your heart. The transmission is a 7-speed automatic and Audi’s Quattro all-wheel-drive, with four different driving modes, is standard. Top speed is 155 mph, but you can get up to 174 mph if you throw down for the Dynamic plus package option. The zero-to-60 time is somewhere around 3.6 seconds, and there’s a $975 destination charge included in that $65,785 price tag. You’ll be able to buy the TT RS very soon, if that’s your thing.